In Serracutisoma proximum, a species belonging to the harvestmen, the mother guards her eggs until the young have hatched. A male can do the job as well, but he does so only when he has nothing better to do, as Louise Alissa and colleagues report. 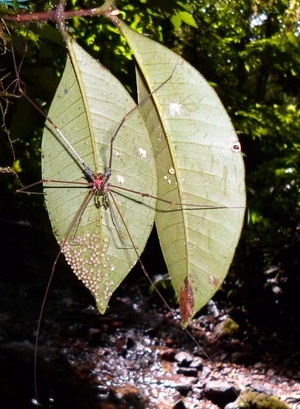 Many species of harvestmen (or daddy longlegs) exhibit a form of parental care: they protect their eggs. This is also true for Serracutisoma proximum, a species that inhabits the Atlantic forests of Brazil. At the start of the breeding season, males try to establish a territory. 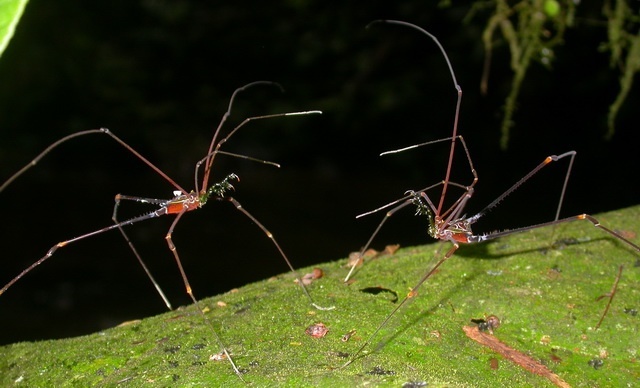 They perform ritualised fights for the possession of an attractive area: two males face each other, extend their strongly elongated second pair of legs and try to hit each other. If one of them gives up and leaves, the other is the owner of the territory. This male then has to wait for a female to arrive. When this happens, he copulates with her and she lays her eggs after fertilising them internally with his sperm. For a month, she will then stay and guard the clutch. That improves the survival, as conspecifics and other predators will eat many of the eggs when unattended. On rare occasions, a female deserts or dies. The owner of the territory can take her place and tend the eggs, but there may be more important things for him to do, Louise Alissa and colleagues realised. A second female may visit the territory, and maybe still another. Around a successful male, a harem forms. The territorial male will copulate which each newcomer female as to increase his number of offspring, and he cannot tend a clutch and court newcomer females at the same time. And that’s not all. There is also a need to guard a female after copulation until she has laid her eggs because of sneaker males, a second type of males (minors) that exist in addition to the territorial males (majors). Sneakers don’t fight for territories (and their second pair of legs is not strongly elongated), but they invade the territories of other males, especially when there are several females present, and try to furtively copulate with one of them to fertilise some of her eggs. The females lay almost all their eggs on the first day after mating with the territorial male, so continuous vigilance during this period is most important. Thereafter, sneaker males still have a chance to sire some young because a few late eggs appear during the next two weeks. Because a successful male must pay attention to newcomer females, he will have less time to guard deserted eggs than a less successful male, the researchers hypothesized. 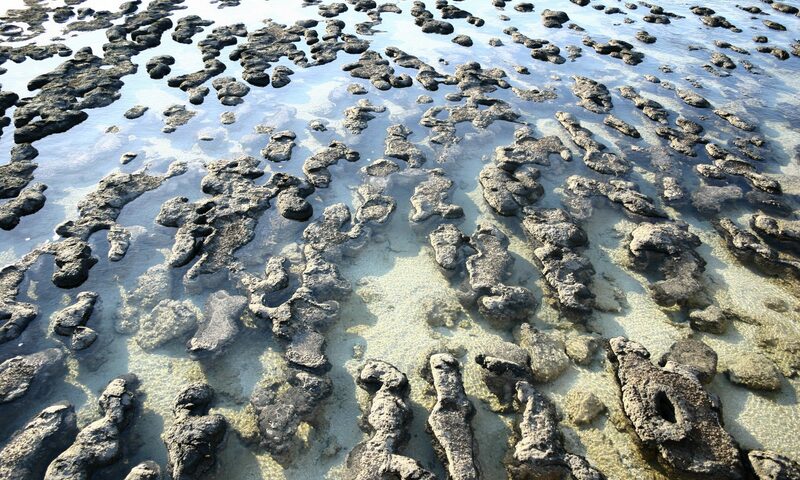 To prove, they removed a egg-tending female from a number of territories that they had been observing for ten days. They then inspected these territories regularly to see whether the owners cared for the orphaned eggs. As expected, males with only one or two females in their territory guarded the deserted eggs pretty well, while more successful males typically spent less time with the clutch. Males can do only one thing at a time.